Year of publication: 1827, English translation by Patrick Creagh 1983. 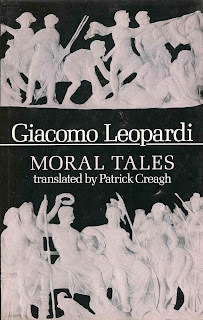 Inner cover blurb: Giacomo Leopardi (1798-1837) is Italy's greatest writer after Dante - poet, scholar and essayist. The Moral Tales (Operette Morali) is a series of twenty-four prose pieces, mostly dialogues, some comic, others poignant, and all highly polemical. They embody Leopardi's views on many aspects of the human condition, and his metaphysical protest against the way things are. The main theme is the impossibility of true happiness anywhere in the universe. For all that, the book is anything but a depressing one. 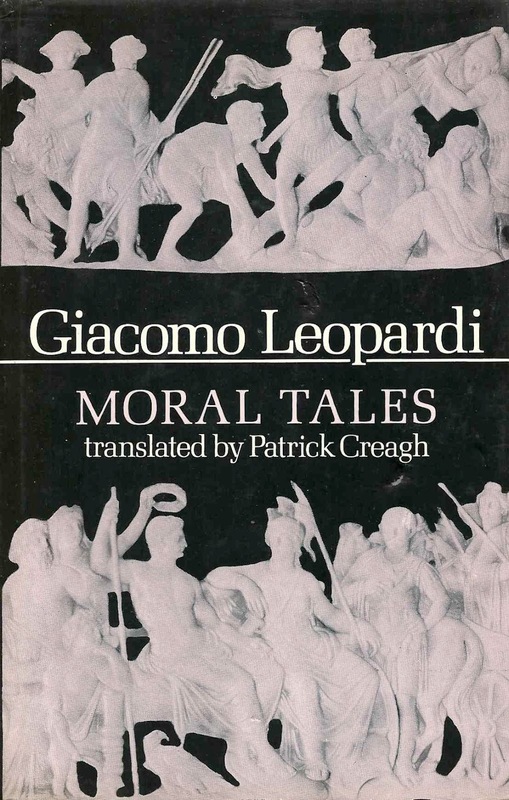 Against the 'acid truth' Leopardi sets the real (although apparently illusory) values of 'cherished imagination - the two poles of all his thought and poetry. The book is so subtle and complex that it is impossible to tell which of them wins. Or rather, neither of them does, the paradox of life remains intact - though lucidly revealed - and the Moral Tales in spite of first appearances emerges as a poetical work, and not a philosophical one. Reading reveals: Truly weird collection of stories by Nineteenth Century Italy's answer to Morrissey, featuring mummies, ghosts, imps, gnomes and Christopher Columbus. Bloody hard work, but a literary masterpiece that virtually no one in the English-speaking world knows anything about.